Over the past year, advertisers have devoted more dollars to programmatic native than ever before. And it’s easy to see why. Programmatic native gives native scale, while bringing more efficiency and data-targeting into the equation. Nativo, TripleLift, Sharethrough, Unruly, and Bidtellect are some of the most well-known players/programmatic native exchanges in this space. To get a clearer picture of today’s programmatic native ad market, my company, MediaRadar, pulled together some of the most pressing trends on the year so far. The number of advertisers placing native in Q1 2017 was nearly identical to Q1 2016 (2,318 vs. 2,326 brands). However, there was a sharp increase in Q2 2017, where the number of advertisers grew 42%, from 2,100 to 2,981 native programmatic advertisers. Why the surge? Good performance. As I have shared previously, programmatic native is generally evaluated on the same KPIs as display. In a contest against most standard IAB ad display units, programmatic native scores well with high click-rates and engagement. And it can scale. Despite the fast rise in programmatic native, 122,241 brands were buying advertising online in the first half of the year. This means that as a% of total, only 2.5% of those brands buy native programmatic. We are only scratching the surface here. Even though large national brands make up the early adopters, there is still significant room for programmatic native to grow. This is welcome news for native exchanges that sell this kind of advertising. They know the opportunity is poised to grow substantially. While total numbers are strong, quarterly renewal rates on programmatic native remain challenged, with only 20% renewing. Specifically, the brands buying in the first half of 2017 share just 20% of the same brands from the first half of 2016. So, for programmatic native to continue its expansion, brands will have to recognize its benefits and make a long-term commitment to the format. Campaign duration remains short, with most native campaigns lasting a median of one month. In Q1 and Q2 2017, 14% and 20% of advertisers ran multi-month campaigns, respectively. During this time period, renewal rates on longer campaigns were much higher than shorter-term campaigns. This is why renewal rates and campaign duration are often tied together tangentially. Longer campaigns mean more of an opportunity to tweak and amend programs, which feeds into higher renewals. Programmatic native is on the rise. And while there are some challenges – namely measuring performance of programmatic native and no definitive, standard set of metrics, as well as some market confusion about what programmatic native can offer – the benefits outweigh them. Yes, the market is still in its infancy – relative to its potential – but it’s becoming increasingly popular. And it has a lot of room to grow. With the introduction of new advertising formats, ad types, and methods of buying and selling inventory, consumer publishing is undergoing some big changes. To get a closer look at what’s working, MediaRadar conducted the “2016 Consumer Advertising Report,” using our data science-powered platform to review these trends for 2016 and Q1 2017. Here’s a look at some of the most notable findings. Native advertisers up 74 percent. High CPM ad placements are surging. Native ad buyers, in particular, are up, rising three-quarters (74%) from Q1 2016 to Q1 2017. This represents the largest growth in buyers for any ad format. 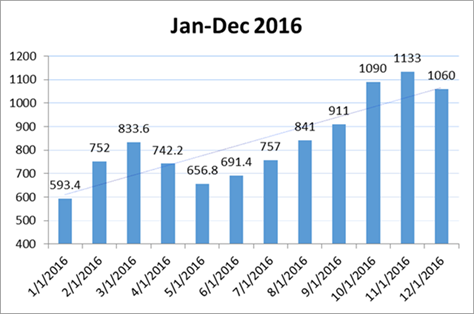 Looking back further, we found that demand for native has nearly tripled since January 2015, which had less than 1,000 buyers (981). In January 2017, there were almost 3,000 (2,882). Consumer advertising is shifting as audience consumption patterns evolve. We foresee advertisers will keep spending more on native because it often outperforms traditional ad units. Print ad spend declined 6 percent. The number of print ad pages in Q1 2016 was 117,551. Compared to Q1 2017, the number of print ad pages has decreased 8 percent year-over-year to 107,698. Similarly, estimated print ad spend has declined 6 percent from Q1 2016 to Q1 2017. However, even with this decline, there are still a considerable amount of pages being bought. We notice niche and enthusiast titles are on the rise, with some regional titles flourishing. Programmatic buyers down 12 percent. According to our data, 45,008 advertisers purchased ads programmatically in Q1 2016. In Q1 2017, however, the number of programmatic advertisers dropped substantially, falling 12 percent year-over-year. On the quarter, more than 5,000 fewer advertisers (39,415) bought programmatically. After years of growth, the decline in programmatic buyers is likely attributed to concerns around brand safety – especially given the recent problems for companies like YouTube. This form of advertising continues to evolve as brands seek more control over where their ads are running. We expect to see programmatic rise as more brands move to programmatic direct models. Our report showed that native is surging, and buyers are investing accordingly. Print ad spend is declining as a whole, but is buoyed by vertical subject matter and titles. Publishers can also expect to see programmatic rise as more brands shift to programmatic direct models. It will be interesting to see how these developments play out in the second half of 2017. The sale of sponsored editorial is up significantly, across almost all big name publishers. BI Intelligence predicts that the native spend will hit $21 billion next year and account for nearly three-quarters of all digital ad revenue by 2021. Similarly, according to our own MediaRadar analysis, native adoption and demand are extremely high. An average of 610 new advertisers use custom content each month. Demand is exploding as native’s impact among consumers – providing a unique ad experience compared to traditional display – has also grown considerably. Despite this success, there are visible cracks in the foundation. Competition and unsuccessful campaigns are driving unusually low renewal rates. The average advertiser renews only 33% of the time. We analyzed the native ad success of a prominent publisher which doubled their sponsored editorial sales in one year. This represents a major success. However, if we look a bit deeper, the results are sobering. In a year over year analysis, while 71% of advertisers did buy sponsored editorial again, only 43% returned to the original publisher, and 29% stopped buying the format entirely. The takeaway: As the market matures and becomes more saturated, emphasis must be placed on winning the renewal. The best publishers today enjoy 90% renewal rates, creating a cash machine. There are several reasons for their success. Clear Objectives: Publishers that see higher renewal rates establish and demand partner campaign objectives in advance. They also test that the objectives are met. Campaign Duration: Additionally, we observe that those publishers with the longest campaign flights (more than 6 months) have much higher renewal rates. This enables for better testing and adapting, as well as provides a greater sample size of data. Native Investment: Those winning renewals have also invested in technology and additional personnel for their solutions. They typically see a 49% renewal rate. Native is a massive opportunity for publishers. However, a lot of work still needs to be done to optimize success and strengthen results. Without the expansion of successful native offerings, demand will outweigh supply, and the bubble could burst. Demand for native campaigns and content has never been higher. Thousands of advertisers are purchasing native ads each month, many for the first time. As native adoption and demand have exploded, formats have also broadened – from native “editorial” to programmatic native and beyond. With so much complexity in this area, how are today’s top publishers defining and committing to native? That internal definition guides their strategies and approaches to working with partners, brands and agencies. It also helps shape the content they feature within their publications. My company, MediaRadar, recently hosted a panel discussion bringing together some of the top experts in digital media to talk about native’s future. Senior advertising executives from BuzzFeed, The New York Times, The Atlantic, Hearst Digital and Quartz were featured. Given the abundance of branded formats and wide-ranging strategies across publishers, each executive spoke at length about how their organizations define native advertising. The Atlantic defines native as a sensibility, according to Michael Monroe, Vice President of Marketing & Head of Re:think, The Atlantic’s in-house creative marketing group. BuzzFeed’s Rebecca Scott, Vice President of Brand Strategy, also defined native through the end-user’s perspective, noting the need to simply tailor content to look and feel like whatever platform distributes it – not just the publisher’s site. With its legacy and reputation in traditional print news media, The New York Times offered its own take. In the end, every publisher has their own native strategy that must live in companionship with their editorial approach, their site aesthetic and more. There is no one-size-fits-all definition. And as native spend among advertisers continues to grow, the market will continue to offer more solutions, formats and services. Todd Krizelman (@ToddKrizelman ) is Co-Founder and CEO of MediaRadar (@MediaRadar). Growing up near the epicenter of technological innovation in Palo Alto, California encouraged him to become an entrepreneur and co-found of one of the world’s first social media sites, theGlobe.com. Krizelman also held leadership positions at Bertelsmann’s Gruner + Jahr and Random House. With his expertise in ad sales and innovation, Krizelman joined veteran web architect, Jesse Keller, to found MediaRadar in 2007. Native advertising is a compelling and profitable way for publishers to offer custom ad opportunities in the form of articles, video, programmatic and sound. What’s more, it provides a creative outlet for marketers, resulting in increased demand and desirability for publishers. With this in mind, we at MediaRadar felt it was important to take a closer look at native trends for a more thorough understanding of best practices, as well as channels. So we recently published a study that observes the native advertising trends that emerged in 2016. The study, “Leaders and Lessons in Native Advertising,” examines thousands of native ads from nearly 13,000 brands. 37% of publishers are not native compliant. In December 2015, the Federal Trade Commission (FTC) released its first-ever native advertising guidelines. At that time, only 29% of publisher sites examined were compliant. That number has increased by 119% year-over-year, however, with 63% of digital publishers having modified their native advertising to adhere to the FTC guidelines. Still, it leaves 37% of digital publishers that aren’t native compliant. 610 new advertisers bought native each month. Adoption and demand for native ad content was extremely high, with an average of 610 new advertisers using native content solutions each month. And many of these advertisers are open to purchasing digital packages – not just native as a standalone. This is good news for publisher ad sales because native continues to drive bigger deals for more revenue. An average native campaign runs for two months. Renewal rates and campaign duration for native remain low overall. Based on 2016 data, native renewal rates are at only 33% across all media sites. An even smaller portion of those – 20% – renew less than 20% of the time. The average native campaign duration is only two months. However, sites with more established native programs have a 49% renewal rate. This includes sites with native programs where more than 50 brands are placing native buys. Overall, there has become a greater demand for native advertising content. More publishers are familiarizing themselves with the FTC native advertising rules than ever before. However, there is still room for improvement, with more than one-third of publishers remaining non-compliant. And while the number of native ad campaigns continues to grow, renewal rates and campaign durations remain low. Also, the media and entertainment industry is the most popular native advertising category, setting itself apart from the rest of the pack in terms of native ad adoption. But this may change in the coming years, as native becomes more popular and more industries begin regularly investing in native ads. Native advertising has come a long way from its debut in the digital marketing environment, when the lines between advertising and editorial were blurry at best. But a new study from the cloud-based intelligence platform MediaRadar, “Leaders and Lessons in Native Advertising,” found that 37% of publishers still aren’t complying with the Federal Trade Commission’s rules on disclosure for native advertising. In late 2015, he FTC clamped down with more guidelines and an 11-page guidebook for businesses to promote more transparency within native advertising and ensure clarity for audiences, as I wrote at the time. Of course, 37% is a huge improvement from 61%, which was the figure cited in last year’s study on non-compliance. But the bottom line is that honesty about native ads has yet to become the status quo. In a world where fake news and ad fraud have troubled audiences and skewed our instincts for what’s valid, it’s to the benefit of publishers and advertisers to work harder. Attracting the attention of users quick to download an ad-blocker or scroll past promoted posts on social media poses a significant challenge for marketers and publishers. Enter native advertising, thought to be the panacea for balancing editorial interest with advertising dollars. The FTC guidelines emphasized explicit disclosure of native ads in proximity to the headline (which, let’s face it, is the only thing many readers will allow their eyes to glaze through). While the IAB deemed the terms “overly prescriptive,” DCN’s own Jason Kint said the impact of the guidelines would largely depend on what cases the FTC brought to the fold. There’s a difference between publishers and advertisers “trying to do the right thing” versus those engaging in “egregious acts of deception,” to use Kint’s words. And we saw the first case the FTC brought up, in March 2016, when it charged retailer Lord & Taylor for allowing 50 Instagram stars to wear the exact same dress — with none of those influencers noting in their posts that wearing the dress was a coordinated campaign. Nylon magazine also ran an article and an Instagram post featuring the dress. It was almost as if Lord & Taylor had decided to blatantly disregard the FTC’s disclosure rules. The FTC saw it as such and brought charges against the retailer, eventually reaching a settlement. The company, for its part, announced that it “never sought to deceive” its customers. But it was a clear warning that the FTC was serious in doubling down on enforcement, and that actions speak louder than words when it comes to trusting marketers. No matter that the FTC’s makeup under President Donald Trump is still a mystery (there are only two current members of the Commission) — the stage has already been set for advertisers to work harder to ensure compliance and not outsource this work to other parties. And if the evolution of labeling content as native indicates anything, most digital publishers are trying harder. There’s been a 119% year-over-year growth in doing so. So how about the 37% of publishers choosing not to comply? They’re risking their reputation and revenue. With native set to continue to grow again this year, it seems only logical to go all-in on following the rules while delivering good advertising, and not circumventing the rules for the same goal. Yet some challenges going forward are that most native advertising campaigns only last a couple of months, and native renewal rates are fairly small at 33% across all media sites. How should we address this? Well, MediaRadar’s study indicates that publishers who have robust native advertising operations and have invested in the necessary tech — including the New York Times, Wall Street Journal and Quartz — have a stronger renewal rate at 49%. Top publishers who sell and measure the impact of native successfully can expect renewal rates of 60 to 80%, according to MediaRadar’s forecast. Invest more in native advertising for more profit. It’s not going away, so seizing the right packages and running campaigns long enough to actually benefit is key. That also means considering the use of in-house native advertising teams, or freelancers devoted solely to creating native advertising. Communicate the results. This helps prove the efficacy of the advertising. And, granted the results are positive, this helps increase renewals. Consider newer ad categories that have yet to jump on the native bandwagon. Media and entertainment, professional services, finance and real estate, tech and retail were the top five categories in native advertising last year, so look beyond those to expand. Invest in the right technology. It will help sustain your business in the long run. Don’t break the rules. Unless you’re OK with potentially risking some revenue (a fine of $16,000 for every native ad violation) and your reputation among users. Try harder. The big issue for publishers who don’t follow the FTC’s guidelines, it seems, is that they want to game the system to make bad native ads work. But sacrificing quality or trust isn’t the way to go. The answer: Better advertising. For many advertisers, programmatic native feels like the holy grail. It brings the transactional efficiency, audience targeting and scale of programmatic to in-feed native units that match the look and feel of a publisher’s content. Additionally, publishers benefit by simplifying native ad sales, with instant access to demand sources through programmatic exchanges. Programmatic native offers real benefits to both sides – buyers and sellers. However, with so much promise, what does the market look like today? To find out, we at MediaRadar, took an in-depth look at what programmatic native advertising spend looked like in 2016. For the report, we analyzed programmatic native adoption over the last 12 months, identifying the number of brands buying programmatic native ads through popular exchanges, like Nativo, TripleLift, Sharethrough, Unruly, and Bidtellect. More Than 4,000 Advertisers: Last year, almost 4,200 unique advertisers placed programmatic native campaigns across the native exchanges we analyzed. Adoption Grew 86% by Year’s End: Programmatic native surged throughout the year. In fact, the total monthly brands buying campaigns increased by 86% – from 593 in January to 1,133, by November. In Q1 2016 an average of 726 brands placed campaigns each month and by Q4 2016 the per month average leapt to 1,094 brands. This is meaningful growth over just a 12-month period. Still, Penetration Remains Low: In 2016, 50,605 advertisers placed online ads on just the top-200 largest publisher websites alone. As percent of that 50,605, fewer than 10% ran on native exchanges. This means that for all the significant growth last year, there is significant headroom for expansion in 2017. There has been a lot of attention given to sponsored editorial and programmatic native in the press in the past year. While the programmatic native market is still small, relative to the overall spend in the digital market, it is expanding and at an accelerated pace. Renewal rates and advertiser feedback are positive, mostly. That’s not to say that challenges don’t exist (The Wall Street Journal tackled these issues recently), but we observe that the market continues to be a legitimately bright spot for publishers. We forecast a positive outlook for it in 2017. Is it good business for your native ads to comply with FTC guidelines? It’s been a little over a year since the FTC published guidelines for native advertising. In just 12 months this has led to a significant shift in how native or sponsored content has been implemented. In our original analysis, MediaRadar discovered that in year 2015 75% of publishers hosted native campaigns without any mention of the content being advertising. With the FTC’s guidelines in place however, that number has dropped substantially. Over January we’ve re-run our analysis. Now just 5% of publishers fail to mark native content at all. This is a significant shift in accountability and transparency. We have found monthly increases in the number of brands placing native, in almost every month. There are 16,000 native advertisers buying ads in the past year, up 73% from 2015. 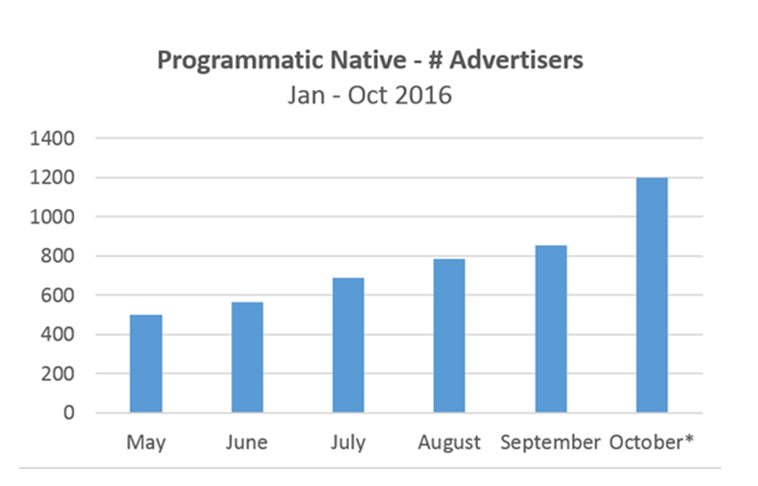 Programmatic native exchanges have become very good at amplifying native, placing 4,182 native advertisers in calendar year 2016. These are advertisers running on exchanges such as Triple Lift, Nativo, Bidtellect, and Giant Media. There have been very few fines over publishers or advertisers violating the guidelines. The FTC set the new guidelines and the industry has reacted and internalized the feedback. It is true that there are still examples of native content that is not complaint with FCT guidelines. Folio covered this as recently as last week. But in the big picture, with our country focused on fake news, there is more emphasis on premium content, and premium transparency, than ever before. The ad ecosystem continues to evolve at a breakneck pace. This velocity can be challenging for publishers who are trying to keep-up with the latest innovations. So, what will 2017 look like? What are the key developments publishers will face? At MediaRadar, we spoke with our clients and pulled data from our platform to help make sense of it all. With that in mind, here are three critical trends publishers need to consider as we head into the New Year. With more than 1,000 sites selling native advertising, the market is maturing. But while native is ubiquitous, this does mean campaign performance is so equally widespread. We see and forecast renewal rates on native to polarize. Some publishers are much better implementing and measuring their impact. Strong performance will lift renewal rates for publishers who are consistently showing their advertisers results. According to MediaRadar data, average renewal rates for 2016 were 33%, with 20% of advertisers at a less than 20% renewal. However, some publishers, like The Atlantic and QZ, have consistently strong performance that outstrips so many. The top native sellers win renewal rates between 60-80%. Last year was the year of programmatic for national consumer publishers. But there was also substantial penetration in programmatic in B2B publishing. Per MediaRadar data, year-over-year, the number of B2B websites selling programmatic more than doubles, from 39% to 82%. Today, programmatic has created a paradigm shift. Traditional B2B publishers now compete with companies like Demandbase, Madison Logic, LiveIntent and others who sell online ads targeted to B2B audiences. We predict that programmatic will continue to see dramatic growth in B2B with more sophisticated offerings including PMPs, tiered pricing, and fixed time periods to maintain inventory value. B2B publishers will master programmatic in 2017 and be able to sell inventory at a high rate due to super targeted, niche audiences. Despite industry fears, ad blocking didn’t take off as expected, nor has it affected ad sales. Yes, many consumers do use ad blocking software. An IAB study found 26% of desktop users as having installed blockers. But we’re not seeing the decline in the number of ads served or total volume of ads purchased. Ad blocking will continue be more hype (and threat) than it will actually create a ceiling on ad spend. Why? Publishers are making ads more palatable, they are speeding up pages (think Google AMP), and demand from marketers for digital solutions remains robust. As publishers try to make sense of the year and finalize strategies for the first quarter, these are areas to plan around. Todd Krizelman is Co-Founder and CEO of MediaRadar (@MediaRadar). Growing up near the epicenter of technological innovation in Palo Alto, California encouraged him to become an entrepreneur and co-found of one of the world’s first social media sites, theGlobe.com. Krizelman also held leadership positions at Bertelsmann’s Gruner + Jahr and Random House. With his expertise in ad sales and innovation, Krizelman joined veteran web architect, Jesse Keller, to found MediaRadar in 2007. It’s been a topsy-turvy year for publishers in 2016, with big pushes into video, native advertising and even VR. But the end of the year saw the rise of Donald Trump, and questions about the power of social media and filter bubbles, along with the upside of a “Trump bump” in paid subscriptions and donations at the New York Times, ProPublica and other places. With 2016 soon coming to a close, let’s look ahead to how the biggest trends of the past year will influence the digital media business in the year ahead. Fake news and the filter bubble, particularly after BuzzFeed’s explosive story on Macedonian teens reaping profits from pro-Trump news sites, have emerged as the topics du jour for media and technology companies following the 2016 election. With users now increasingly aware that red feeds and blue feeds exist as competing truths on their favorite platforms, all parties involved – from technology behemoths like Facebook, Google and Twitter, to media executives and publishers, to individuals themselves – must bear the burden of addressing this issue as 2017 unfolds. Facebook and Twitter have both announced measures to help stop the spread of fake news, particularly by limiting advertising from fake news websites on its platforms. Facebook has reportedly filed a patent for a technology that would help users spot and report “objectionable content,” and is working with top news publishers to curate content directly into news feeds, both of which would presumably help curb an infestation of bogus content. And news consumers themselves will need to brush up on digital news literacy if they want to understand where content comes from and who’s behind it. Speaking of ups and downs, publishers have had a tough time coping with the growing power of social platforms, especially Facebook, as they command attention but don’t always play fair. Facebook continues to err in disclosing accurate ad and video measurements, while Twitter confuses analysts and consumers alike by banning, and then reinstating, the account of white nationalist leader Richard Spencer. Their standards will have a wider influence on the industry – particularly when it comes to free speech, hate speech, and the limits and freedoms of platforms to censor content. What publishers can do in working with these platforms is multifold. First, they must consider whether they want to continue to trust and sustain social media ecosystems (that were built in large part on the appeal of their content), while competing with them for advertising and distribution. And if it is the case that Facebook is not investing in publishers the way they should and Twitter is declining in importance, then perhaps publishers need to invest more in other platforms like Snapchat and Google AMP rather than Facebook’s Instant Articles. More likely, publishers will need to work together to push platforms like Facebook to work more closely on initiatives that are a win-win for both sides. Making sure analytics are right, ferreting out fake news and developing long-term revenues for Facebook Live would go a long way toward collaborative goals. Despite Donald Trump’s war with mainstream media, his election has helped the bottom line for news publishers and media outlets. From ProPublica to the New York Times, The Atlantic to Columbia Journalism Review and the Los Angeles Times – all have reported increased readership and interest from audiences, whether in the form of web traffic, donations or direct subscriptions. Will this paid content boom last? The Financial Times had a similar “Brexit bump” and has largely kept most of its uptick in paid subscribers, so we will see. But it’s interesting that there’s less emphasis on eyeballs-for-eyeballs’-sake and more interest in paid premium content. Two new digital startups, The Outline (from Joshua Topolsky) and Axios (from Politico founder Jim VandeHei), have pushed quality over quantity, with manifestos against the chase for clicks. VandeHei, in particular, is pushing $10,000 subscriptions at Axios. We’ll see if people continue paying up. This year saw so many publishers push harder into video, and push harder toward native ads and branded content. On the video side, publishers like Mashable and BuzzFeed went all-in on video, while startups like NowThis and OZY are basically built for video. And traditional publishers like the New York Times, Time Inc. and the Wall Street Journal have invested deeply in their in-house studios to deliver branded content. Vice Media and BuzzFeed have also said that branded and sponsored content offered a substantial chunk of their 2016 revenues. And that parallels the push by Facebook, Instagram and Twitter to make big bets on video, including live-streaming, where Facebook paid publishers to produce content. But how much is enough, and when do you get to overkill? We know that advertisers love branded content and video ads, and publishers know that their video is eminently sharable on social media, but is this what consumers really want? When you have a glut, only the best quality can survive. People will gravitate toward quality content, toward timely content, toward content with a personality. That means data and surveys will play an outsize role in which types of branded content or video – or heck, branded video – will make it in the long run. Virtual reality was a media darling in 2016, but it’s still a far way off from mass consumption. More than anything, it’s going to take actual demand from the consumer, and widespread adoption, for it to become truly profitable. 2017 may not be the year we’ll see that, but the VR and AR markets are expected to grow in the long run as the hardware and techniques for investing in the tech become cheaper. Bots, meanwhile, will become a hotter topic in the coming year, especially given Microsoft’s forthcoming Azure cloud service that will help developers build bots more easily. Yet again, consumer attention remains an important consideration. While bots may seem like a convenience, and have caught on in Asian countries, developers are going to have to work hard to convince people of their necessity in order for the tech to truly take off and become profitable. An incoming Trump administration has Net neutrality advocates worried that a reversal of federal policy is likely despite Trump’s silence on the issue. His main public comment on Net neutrality, from 2014, is a tweet asserting the FCC’s move to reclassify the internet as a utility was “another top down power grab of the Obama administration.” His appointees to the FCC transition team have all been critical of current Net neutrality rules, so this could lead to yet another battle over the rules. Although Trump promised that he would fight against the $85.4 billion AT&T/Time Warner deal, which he lambasted as “too much concentration of power in the hands of too few,” it seems he may be tiptoeing back on that line. AT&T executives, at least, seem confident the merger will pass regulatory scrutiny after meeting with Trump’s transition team. Whether this suggests more mega-mergers in media and tech likely depends on just how fickle Trump proves to be. And when it comes to privacy, all indicators suggest 2017 and the following three years will be turbulent times. With more reports of hacking and press freedom under threat, the Signal app – which security researchers say offers the most privacy protection out of all messaging apps – has experienced a 400 percent jump in daily downloads since November 8. It has been a few years that native advertising is being actively placed in the market. With the year-end approaching, it’s a good time to take stock of what we now know. At MediaRadar, we’re now not just tracking native ads, but also studying how native is bought & sold, and are coming to a view of what is best practice. Posted below are some of our key findings. Native, a saturated market? Surprisingly the market is not yet saturated. Over Year 2016 we’ve tracked a median of 610 new advertisers buying native, for the first time ever. This is substantial. And we’re finding native ads across b2b, enthusiast, regional, and science media. Native is no longer for certain large consumer sites. Renewal rates. To provide an average here would be misleading. In fact what we see is polarized renewal rates. Out of the ~1000 websites that sell native, most have low renewal rates, under 30%. This is going to make scaling up native advertising a significant challenge. In contrast, there are a few dozen firms that are very focused on client success. They enjoy renewal rates above 70%. This includes some of the best performers, including brands like Quartz (QZ.com). Campaign packaging. We observe that it’s exceedingly rare to see native advertising running stand-alone. It’s much more common that native advertising runs as part of a broader campaign. The most common campaign is to run display for 30 days, then 30 days of both native and display, and then a final month of display. Duration analysis. Across 16,998 brands that have placed native over the past 2 years, the most common is one month only. It’s surprisingly brief. Just under 20% of brands are running campaigns for six months. Programmatic vs. Direct. In the past two years we’ve seen the rise of programmatic native – both display and in video. Without question, the product is marketing different than direct native. Programmatic native is display advertising that looks-and-feels like editorial. However, these ads don’t typically link to sponsored editorial. In contrast, direct native does. This is the kind of programming that Buzzfeed, Forbes, and Huffington Post are especially so well known for. Posted below is an overview of the massive growth we’re seeing from some of the leading programmatic native companies. This includes name native exchanges such as Nativo, TripleLift, Sharethrough, Bidtellect, Teads, Unruly, and Giant Media. Recommendation. Native advertising renewal rates correlate tightly with campaign duration. Those winning six-month deals have the highest average renewal rates, with the lowest renewal rate variance. In surveying those most successful publishers we heard consistent feedback: Require clients to commit to longer term deals. This gives you, the publisher, more time to course-correct, to respond to client needs, adjust creative, adjust marketing support, to absolutely make sure that you’re helping the client meet their campaign objectives. This, more than anything, drives up renewal rates.